Nicholas Colon is the Managing Director of Alea Consulting Group, a casino gaming consulting firm with a player centric philosophy. It is staffed with world-class players, gaming authors, mathematicians, top legal minds and a variety of industry professionals. Sometimes an edge is skill, requiring a precision and highly accurate opponent-reading; an example is Doyle Brunson at the poker table. Sometimes an edge is a good grasp of mathematical complexity; an example is the high frequency Wall Street trader employing light speed long/short executions a thousand times per second. Sometimes it's known as "the secret sauce" - especially among the most successful gamblers and gambling authors in history, on the caliber of James Grosjean, Ed Thorp and Bill Benter. Whatever you want to call it or describe it, the hard part is finding your edge-- and more importantly, keeping it. As if that is not hard enough, you have to make certain no one else knows what you're doing; therefore, it works best if you can keep it to yourself. The unique skill of "pattern recognition" can be very lucrative in the casinos located on Las Vegas Boulevard as well as all over the world. This is how many legendary gamblers got their start in the casino gaming world. The purest form of mathematically driven economics is casino gaming. The house has a built-in advantage in each of their games; this is how it makes money. The smart gamer strives to overcome that advantage--either by short-term positive variance or by engaging in legitimate practices that surpass the inherent advantages enjoyed by a casino. Occasionally, someone comes along that is so skilled he or she transforms certain games into profit centers, not for the house, but rather for the player. Phil Ivey is the personification of this. He was born in Riverside California, and his parents then moved to New Jersey. When he was a teenager, he began betting in the Atlantic City casinos. Now, he's one of the top gamblers in the world. Ivey is best known for his superior poker play and he holds 10 World Series of Poker bracelets. His understanding of game theory extends to almost any play offered by any casino. A few "game protection" heads of major casinos fear Ivey so much that they will not even allow him to play slot machines. Yet, some will bend over backwards to get him into their joint. Why is that? Because of the size of his betting - which is large. In return for his big bets, Ivey will ask for and receive certain "conditions" for his play. "May I request an Asian dealer?" "Of course, Mr. Ivey." "Okay if I bring my Asian friend to play alongside me?" "Of course, Mr. Ivey." What Phil Ivey didn't tell them was that his Asian friend Cheung Yin Sun (aka Kelley) was a highly accomplished advantage player and was requesting that the dealer place the cards in the discard tray in a very specific way. The dealer was more than happy to accommodate, because for dealers, high rollers mean high tips. By their very nature, games are a medium where two people attempt to out-think one another, either by strategy, or by applying information gathered while playing. The common theme in all games is this: there is a winner and a looser. By extension, one person is determined to be smarter than the other is. Two casinos found out that Mr. Ivey might be smarter than them: The Borgata in Atlantic City, and Crockford's in the United Kingdom. Phil Ivey beat them out of 9.6 million dollars and 12.1 million dollars respectively. Ivey did this by engaging in advantage play against the casinos. That's where one person tries to gain, well, an ADVANTAGE over another by exploiting weakness in their opponent's strategy. This can take the form of getting a casino to break from standard procedure to accommodate the requests of a high-wager player. The latter is a common practice among casinos for "Whale" players in gambling meccas like Las Vegas, Atlantic City and Macau. In edge sorting, the objective is to arrange the cards in such a way that key cards are turned one direction and no- key cards are arranged in the opposite direction. The advantage is gained by exploiting the standardized procedures in a casino; for example, in the way the discards are picked up and placed in the discard tray. Sounds relatively easy, but it can be very difficult to pull off unless you know exactly what you're doing. Highly disciplined card players are required. 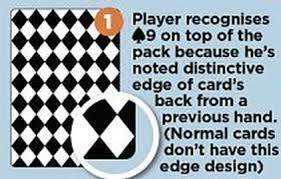 The game that Ivey applied edge sorting was baccarat. The requests made by Ivey were to use a specific brand of cards, to use the same cards over the course of his visit, and to use a specific type of shuffle machine. Normally, the casino's powers that be would ignore such request -but in rare instances, like in Ivey's case, accommodations are made as long as the player agrees to play at a certain minimum betting level (usually thousands of dollars per hand), and play for at least a specific number of hours a day. Most importantly, they must deposit funds (usually north of one million dollars) into the casino's cage prior to begin playing. Each party has their own set of criteria they adhere to in attempt to gain an advantage over the other. In the Ivey example, the casino saw an opportunity to make a decent amount of money given their terms, and the player saw the same opportunity given their terms. However, in any competition there must be a winner and a loser. It so happens that Mr. Ivey was the big winner and the two casinos were the big losers to the tune of over 20 million dollars. Ivey maintains his innocence and many gaming experts agree with him. In an industry where being branded as a cheater is essentially a kiss of death, Ivey maintains that he did nothing to gain an unfair advantage over the casino. He goes on to say "As a matter of fact that casino did everything for me." I am experienced in the laws of probability and it is my opinion that his actions did nothing to alter the governing laws of probability and variance. What he did do was increase his advantage and in turn increase his expected value while reducing the number of hands at which the standard deviation is equal to the expected value. These two concepts are a mathematical necessity when determining whether your results, good or bad, are a function of luck or skill. The edge that Ivey gained over these two casinos was between 5 and 6%, and considering that most of Las Vegas was built on games that fall between 1 and 3%, it's easy to see how Ivey won so much money and why the casinos are so upset. In the final analysis, Phil Ivey is smart. Countless other persons in the world have the ability to see things that others do not. Each one uses their intellect to find an edge.